Ok, ok...I know I keep going on...and on...and on...about that slightly-oversized Opera House cabinet I have been working on for my living room, so thought I would give you a little sneak-peek. It is in the home-stretch...I have to do a little distressing...install new glass shelving...and put the sliding glass doors on the front. But I could not wait to show you a little peek. I am soooo happy I decided to leave the areas that were raw pine natural! It is such a beautiful contrast to my white ironstone collection that will be on display inside. I am in love with that bowl in the center. I have never...ever...seen another one like it. It is a rather large size and has a metal rim...so cool! Anyone out there know what it was for? Maybe it had a lid?? I am not sure about the handles...I left them in their original state for now. They look black in the photos, but they are old, and solid brass, so have a great dark brownish-bronze patina to them. I may keep them this way, we'll see. The inside of the cabinet has a little writing here and there. No idea why...but I love it. I could never paint over it. Now, did I happen to mention that my beloved cabinet seems a bit too large for my room?? Yeah. Just a little snag in my plan. It is just so massive, it makes everything else look a little small. I had a feeling that would happen when I bought it, but had to take the chance anyway. My room is 33ftx16 ft...so rather bowling-alley-ish. The scale of the cabinet really needs a much larger room...but it is what it is. And I love it. So it is staying. I'm off for another day with the paintbrush. I have a coffee table, 3-drawer bombay chest and a full-length mirror to get done today. This is a piece I delivered yesterday. Let me tell you, there is nothing like a girly white dresser to make a little girl soooo happy! Oh, and Happy St. Patty's Day, girls! OK that cabinet is fabulous! I love the hardware as is - and the writing in it - I'm just like you - never paint over that stuff! My Mom is going to adore your ironstone collection - she has her own - the bowl with the metal - very cool as well - love it all! 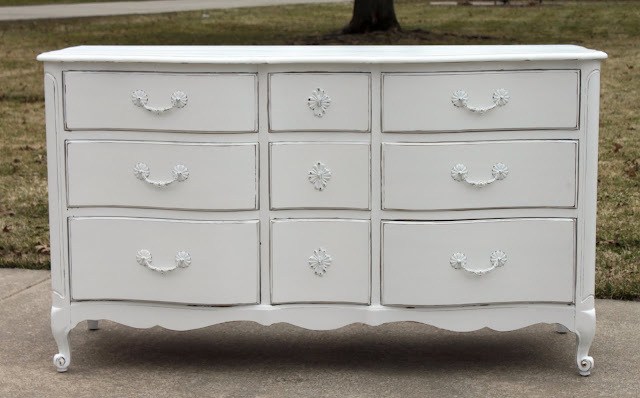 That dresser make-over is also fabulous - I bet that little girl melted over it! Well that was a tease! :) I can hardly wait to see it - big or not, it would stay with me forever. Just imagine all the things you can do with for the holidays and seasons. Beautiful job on the dresser! Can't wait to see the finished product! Love the dresser too! I've been waiting to see the cabinet! From what I can see now, I am going to love it! :) The ironstone is beautiful, too. The piece with the metal rim looks like it used to have a cover. I've not seen one before either! I do want to let you know about the sale here on the farm - there's a link under my header on the blog - I would love to meet you and have you sell here someday! The cabinet looks amazing...love that you kept the inside natural...and I really like how the aged handles look too. I am in love with your cupboard. It is simply beautiful. Happy Patties day to you too! eek love the cupboard & the dresser!! The cupboard and the dresser are fabulous! Your new cabinet is beautiful! And I agree that the contrast between the white paint and natural wood is perfect! I cant wait to have a house of my own so I have room for large items like this! That cabinet is beautiful...no wonder you keep going on and on;) Happy St. Patty's day to ya! Oh my goodness, you are a girl after my own heart! LOVE the hardware (I want the same look for my white kitchen cabinets). Your painted pieces are just beautiful. 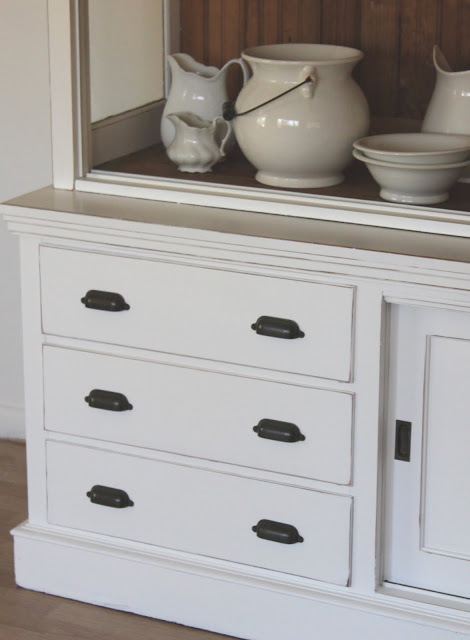 The cabinet and your ironstone collection is just wonderfull, can't wait to see it all put together! Love your work! The cabinet looks amazing and the dresser is just lovely. Can't wait to see more! oh leave the handles, I love them they really make a great finish to the whole cabinet. wow! that girly little dresser is fantastic! 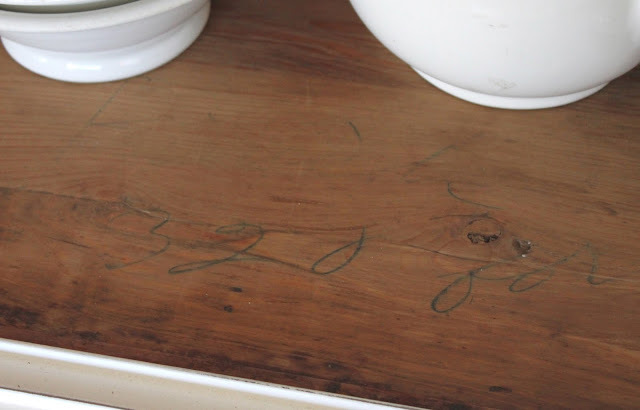 and the writing on the cabinet...it´s fab when you find historical pieces like that. like your the work your hands do..
Hi Mary! I absolutely love what you have done with your cabinet. The combo of white, wood and old hardware is perfect. Gorgeous. And, I have to say after reading this, I ran out to my front room and measured .... 12x29, and bowling alley is the perfect description! I've never known what exactly to do with it - such an odd shape, but at least now I know I'm not alone in my long skinny roomness. Mmmm....pretty!!! I'm casting another vote that the cool bowl had a lid and for keeping the delicious hardware...as is! So, do you just stand/sit there and stare at your swell cabinet's yummy goodness? Love what I see so far!!!! So glad I'm back, or I would have missed this post. 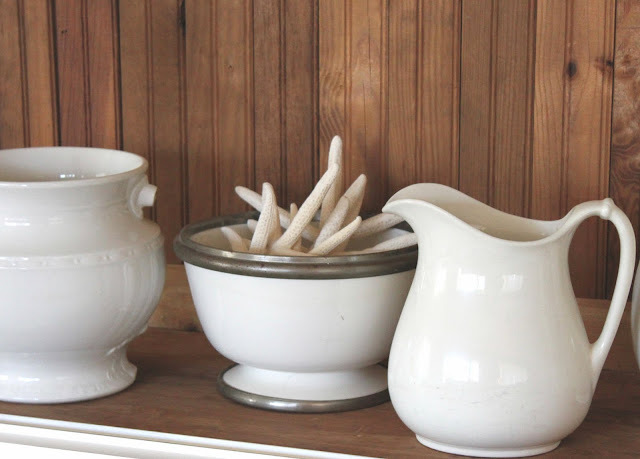 LOVE the ironstone, and that bowl... how interesting! I am in love with that piece! It reminds me of one I had years ago,and sold to a man because I thought I would never find a place for it.. I kick myself every day! I love the contrast of the white against the pine and the knobs are perfect! Bea-u-ti-ful!! !